MEDICAL COSTS SINCE SEPTEMBER 2013: $6,171.57 PLEASE CONSIDER MAKING A DONATION! Carrie, aka Turbo Carrie, is a 2-year-old red female born March 12, 2012. Her sire is Flying Hydrogen and her dam is Turbo Wind Blown. 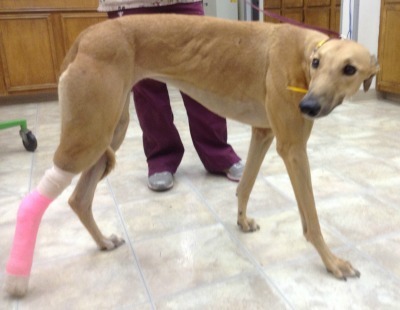 Carrie has no races on record, as she broke her leg on September 17th while training. Carrie has not yet been tested with cats or other small animals. New pictures coming soon. Carrie had surgery on September 21, 2013, performed by Dr. Stephen Kerpsack of the Central Texas Veterinary Specialty Hospital CTVSH in Austin. Her surgery for a central tarsal bone fracture required implantation of four screws along with two tension bands. Her cast was removed on November 7, 2013, and the implanted bands and screws were removed on November 25, 2013. Dr. Kerpsack released Carrie on December 10, 2013, and he is very pleased with outcome, as her fracture was a very difficult one. After surgery and many weeks of quiet recuperation in her foster home, Carrie's leg is healed! In a tragic turn of events, Carrie has re-broken her leg. She is being evaluated at the Dallas Veterinary Surgical Center. DVSC referred Carrie back to her original orthopedic veterinarian, Dr. Stephen Kerpsack, at Central Texas Veterinary Specialty Hospital in Austin for evaluation of the re-fracture of her right calcaneous that now has an open wound. A six hole 2.7mm DCP plate was placed with additional screws. Her splint and bandage will be replaced weekly and it is hopeful for removal in 7 weeks. Because of the open wound, a culture was taken at the fracture site. Results are expected in several days. Results from the culture are back, and Carrie will be on antibiotics for the duration of the 7 weeks. Dr. Kerpsack is hopeful for a good prognosis; however the plate will most likely have to be removed at a later time. Carrie is back out of her splint, and Dr. Kerpsack says the x-rays looked very good. She will be leash walked for two more weeks before being cleared. Carrie's leg is once again healed!